Adequate undergraduate GPA is required to perform successful study in Master's degree program. Adequate undergraduate/graduate GPA is required to perform successful study in Ph.D. program. Graduate students are divided according to the type of scholarship selected at the time of admission. The types of scholarship: Government-sponsored scholarship, KAIST scholarship, and General Corporate-funded scholarship. In order to apply to the Ph.D. (or Master's/Ph.D. combined) program, you are required to have an advisor in the EE department at the time of application. Please contact your potential advisor (by exchanging emails, etc.) and determine your advisor before applying to our program. 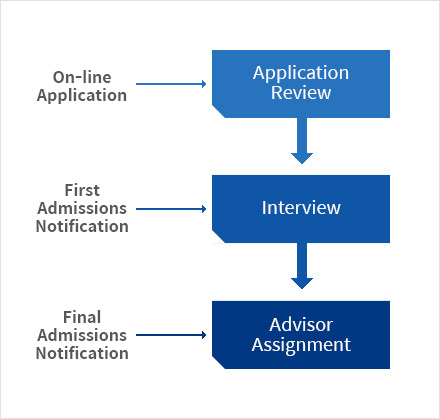 For Master's degree program, you are not required to have an advisor at the time of application, but we highly recommend you to determine your advisor before application. You can still find (or even change) your advisor on a "Happy Marriage" basis even after admission, but statistics shows that a few students have difficulty in finding advisors during a semester. Admission to the graduate school distinguishes the students into the Master's degree and the Ph.D. programs. The integrated Master's & Ph.D program will be applied only to those who have completed the first semester in the Master's degree program and have obtained the recommendation of the current academic advisor or the approval of the department chair. New graduate school applicants cannot apply for the integrated Master's & Ph.D. program before being admitted into Master's degree program and meeting the requirements above. Students in Ph.D. program or in integrated Master's & Ph.D. program who have not done the military service may start their duty as a research agent for three years after the course works are done (at least 1 year after the admission). Note that this information is only for Korean students. If you are an international student, please refer to the menu "International Students."